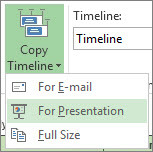 A timeline can really help you out when you need to report “big picture” project information. It’s a professional-looking snapshot of key tasks and milestones that’s good to go in any status meeting — just drop it into a PowerPoint slide or Word doc, or email it to your boss. For E-mail. Small. Fits easily in an Outlook email message. For Presentation. Medium. Designed to work in a PowerPoint slide. Full Size. Large. The same size it appears in Project. Paste the timeline into any program that displays graphics.